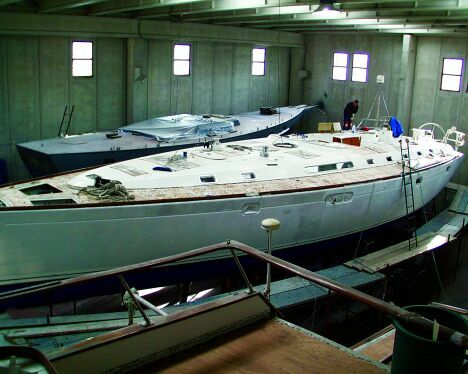 An interview with Mr. Alberto Giannerini, Managing Director for the technical and commercial side of the Esaom Cesa boatyard, previously Technical Director for Lusben Craft. Mr. Giannerini, we know there are some new ideas that concern you, in particular for large boats. Can you outline these for our readers? We have recently developed a new industrial plan that calls for redimensioning of the structures we own, and acquisition of new work instruments such as a 700 ton travel lift. We already have the structures for the refitting and maintenance of large yachts, but we intend to get a better hold on this sector and for this reason have decided to further invest in structures and personnel training. What kind of intervention can you ensure at the Esaom Cesa Group's structures at present? You must consider first of all that the Esaom Cesa Group represents one of the largest realities in Europe in this sector. 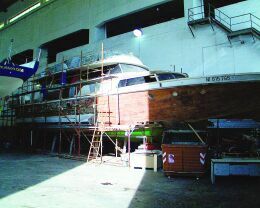 The services that we are currently able to offer in the Group's three facilities, that is in the Cantieri Navali Esaom Cesa, Edilnautica and Cantierino, range from winter laying up, to refitting, to ordinary and special maintenance work. We also have 296 berths at the Group's own landing, where our clients can find everything you would expect in a modern, well-equipped marina. Among other things our workshops are authorised by the manufacturers to operate on Aifo, Caterpillar, Honda, Mariner, Mercury, Volvo Penta, Yanmar and Man engines. Therefore we can intervene both on small propulsors for boats as well as on large cubic capacity engines for super yachts. Furthermore, we are able to intervene with great professionalism for any type of need, our personnel is entirely made up of professionals enabling us to meet requests for technological and sophisticated intervention at any time of year. Correct me if I'm wrong, but isn't Man a new entry in your case? Yoùre right. We have invested a lot of resources into the preparation of our engine technicians with the precise aim of meeting the needs of the larger boats on which Man engines can often be found, as we have done in the past with Caterpillar. This investment comes under the industrial plan that I was talking about before. Do the spaces presently at your disposal permit you to work on large yachts? 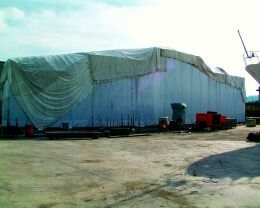 Certainly, the sheds we have enable us to work under cover also on large pleasure craft; just think that we operate on a covered surface of over 14,000 square metres, of which 2,500 is used for the mechanical and electric workshops. The Esaom Cesa Group includes three historic realities on Elba, each one of which has kept its specificity, creating synergy with the others. This permits us to meet varying needs, like those of professional boating and of pleasure cruising. Do you also collaborate with other companies on Italian territory? Yes, we have recently signed an agreement with the Euronautica company, an Azimut dealer, which means preferential assistance for their clients plus an exchange of offices, in other words, we can work on their premises in Viareggio, Lavagna and Sanremo, and they will be able to use an office of ours here in Portoferraio. But the collaboration between the Group and Euronautica doesn't end here; in fact, just next summer we will be setting up assistance service in Sardinia during the summer months dedicated both to our clients and those of Euronautica. What will this be exactly? Basically we will send two people who work within the Group during the winter, an electrician and a mechanic, there for the summer period, who will have a travelling workshop at their disposal, an equipped van, that is. Our operators will be based in a resort in the North East of the island, but will be able to operate at all the Sardinian landings. The service will be guaranteed 24 hours a day during the months of July and August. As I have already said, the alignment of our structures with the growing request in the sector of large yachts, the development of services we already offer successfully and the presence of the Group with a stand at the Shows in Cannes, Montecarlo and Genoa.